The GBPUSD pair remains in uptrend from 1.3039, the fall from 1.3549 could be treated as consolidation of the uptrend. As long as the price is above the trend line, the uptrend could be expected to continue and next target would be at 1.3657 (Sep 20 high). Near term resistance is at 1.3549, a breakout of this level could signal resumption of the uptrend. 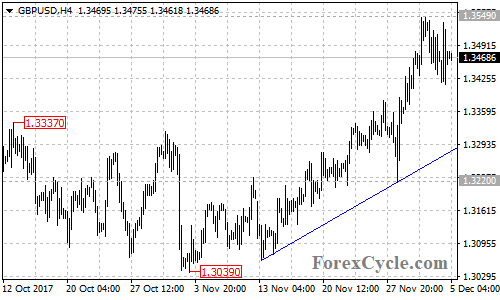 Near term support is at 1.3375, below this level could trigger further decline towards the rising trend line on the 4-hour chart now at around 1.3280. Only a clear break below the trend line could signal completion of the uptrend.